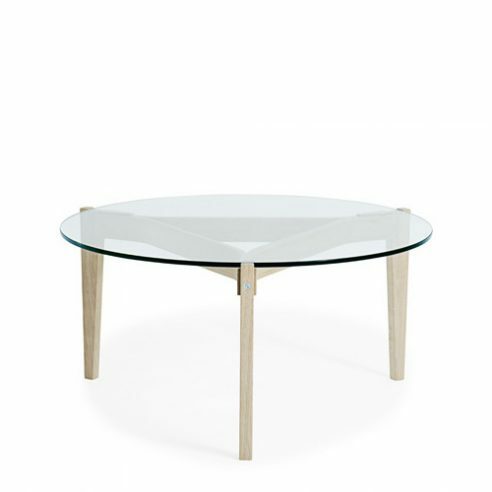 Designed to compliment the GE460 Butterfly chair the glass topped sofa table GE465 is available in a choice of two diameters. The Butterfly Chair (GE460) is a visual detour in Wegner’s oeuvre, and the many small models that were used for preliminary studies reveal a development process with a number of steps along the way. The chair is actually related to Wegner’s shell chairs, and like the Three Legged Shell Chair CH07 has removable upholstered pads mounted onto the seat and back shells. Jorge Ferrari-Hardoy, Antonio Bonet and Juan Kurchan’s iconic Butterfly Chair from 1938 is an easy chair on a light steel frame covered by stretched fabric or leather. Its shapes are round and organic. Being a folding chair, it can actually flap its ‘wings’. Wegner’s Butterfly Chair is unable to do this, since its ‘wings’ beautiful movement is frozen in place. The seat shell is detached from the frame, making it easier to upholster, whereas the back is a load-bearing element of the chair’s construction. There is a V shaped cut-out at the base of the back that at first glance appears to be ‘merely’ another empty space in the sculptural whole. In reality it is one of Wegner’s renowned construction details that serves to hold the upholstered back pad in place. This is because it is equipped with an upholstered flange that can be pushed up so that it sits visibly fast to the back of the chair. This not only holds the upholstery in place but serves as a decorative detail when viewed from the rear. The production drawing reveals that the chair’s design was finished in 1976, but production did not begin until 1977. It was exhibited the same year at the Furniture Fair in the Bella Centre in a red painted version with upholstered in black and white striped fabric. Sales were slow, and it was not until Getama re-introduced the chair in the early 1990s that production really took off. The Butterfly Chair experienced a renaissance at the end of the 2000’s when it became a popular easy chair, especially the version with an untreated oak frame and upholstery in black leather. In the United Kingdom the Butterfly Chair is sold exclusively by the John Lewis Partnership and ourselves.